Missing Persons poster issued by the FBI on June 29, 1964, shortly after the men went missing. Fifty years ago this week, three men who were working for Freedom Summer, a project to register black voters in the South, disappeared. 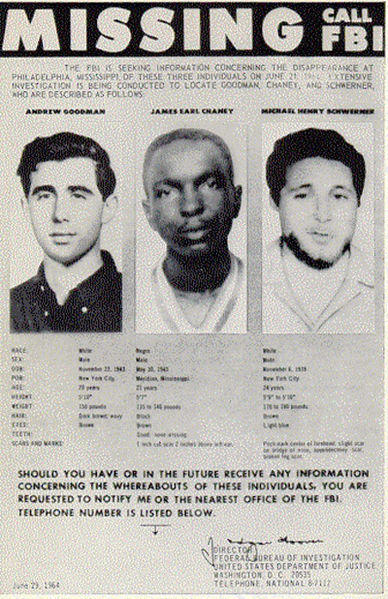 The bodies of Andrew Goodman, James Cheney, and Michael Schwerner were found 44 days later by the FBI. The men had been driving through Mississippi when they were pulled over by Deputy Sheriff Cecil Price and led off the road, where they were shot and killed by members of the local Ku Klux Klan. Before she passed away in 2007, Goodman's mother Carolyn collaborated with author Brad Herzog on a book called My Mantelpiece, a memoir of survival and social justice. Herzog talked about his collaboration with Mrs. Goodman, who was an activist herself, and the influence she had on her son. Herzog said the collaboration came about by chance. He was writing a travel memoir about towns with virtuous names such as Hope, Mississippi. Hope is located near the town of Philadelphia, Mississippi where the murders of the Freedom Summer volunteers had occurred. The visit piqued his interest in the three men, particularly in Goodman’s mother, which led him to write about her for a magazine. “Then she asked me to co author her memoirs with her, and over the course of several years I got to know her very well … and she unflinching told me her story,” he said. Herzog discussed what he believed to be most crucial moment of Mrs. Goodman’s life. It's also the moment he chose for the opening of My Mantelpiece, when Andrew asked for permission to volunteer in Mississippi. Proceeds from sales of My Mantelpiece go toward the Andrew Goodman Foundation. Community County of Allegheny County Professor Ralph Proctor has just released his latest book Voices from the Firing Line: A Personal Account of the Pittsburgh Civil Rights Movement. Written as a personal narrative, the book discusses demonstrations and the methodology of those in the movement, as well as the results they achieved. Proctor said he remembers a segregated Pittsburgh, even though he was far away from the Jim Crowe laws of the south. When the Rev. Dr. Martin Luther King Jr. delivered his famous “I have a dream” speech in 1963, he brought the Civil Rights movement into the homes of mainstream white America. As the first big integrated protest to be staged in the north, PR counselor and executive speech writer Bob Oltmanns says at that point in history, the speech was a breakout PR moment. Greensburg native, William Severini Kowinski was 17 years old when he participated in the March on Washington for Jobs & Freedom on August 28th, 1963. He had been campaigning for John F. Kennedy since the age of 15 and was inspired by Kennedy’s views on the civil rights struggle. Kowinski went by train with a group called the Catholic Interracial Council. It was only his second train ride and his most vivid memory of the ride involved a train car packed with young people.